Sochi was transformed into a scene from an Armageddon movie when a dozen tornadoes descended on the Black Sea resort. But instead of a feeling of imminent doom, an eyewitness who filmed 3 waterspouts next to her plane, noted that no one panicked. 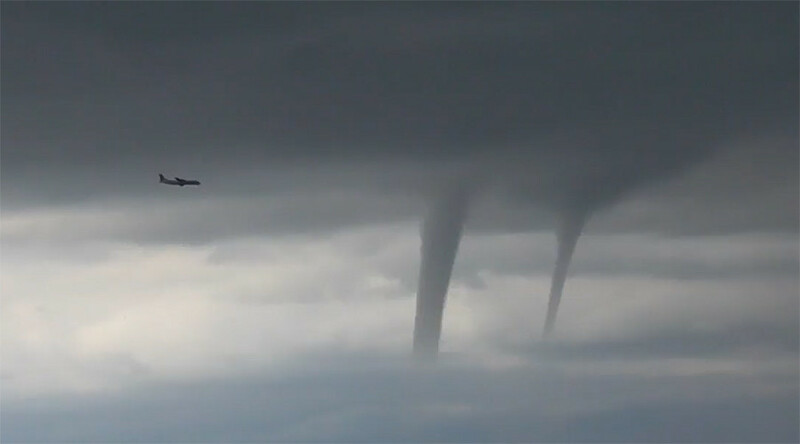 Footage of the Sochi’s tornadoes quickly made international headlines. One especially harrowing picture taken Tuesday by Kseniya Vasilieva showed her plane landing in Sochi with three tornadoes to its left. Twisters seen in the snapshot showed just a fraction of almost a dozen waterspouts that hit that day, the peak of the tourist season. “The sky turned black, some kind of blotchiness appeared. We began to look closely because we could not distinguish between anything. At first, we thought that something had happened, then it all began to turn black, and tornadoes began to descend,” Vasilieva told RT. “At some point, it seemed to us that something had fallen... in fact, no one reacted on the plane, we just filmed it,” she explained. Despite the terrifying experience, the pilot was able to land the plane safely, with no incidents or injuries reported. Sochi had been put on red alert after heavy rain and thunderstorms disrupted flights at a local airport. The warning, which is still in effect, has been well founded, as up to 11 twisters descended off the coast Tuesday. He himself sought shelter under a palm tree and continued to record the weather show. Vorontsov says locals are used to seeing waterspouts this time of the year. “As a Sochi local, I can say this kind of weather is normal and usually occurs at the end of hot summer. Good summers usually ends with tornadoes, foul weather, and heavy rain,” he added. The bizarre weather did not limit itself to just twisters. Snow has fallen in the mountains above Sochi at an altitude of 2320 meters. In addition, two mudslides descended in the vicinity of the city, blocking traffic. Due to the worsening weather conditions forecast for Thursday, people in Sochi are advised to avoid staying in the mountains or by the coast, the press service of the city administration reported. Authorities have warned of more waterspouts, mudslides and floods in the region. Rescue and Emergency services remain on high alert.